Wandering Heroes of Ogre Gate (WHOG) draws on a number of sources for inspiration. I watch a lot of wuxia movies and TV shows, and these have had a big influence not only on Ogre Gate, but on Sertorius and many of my d20 campaigns. I am hoping to share some of my favorite movies and shows in the genre here as we work on WHOG. This review contains many spoilers. 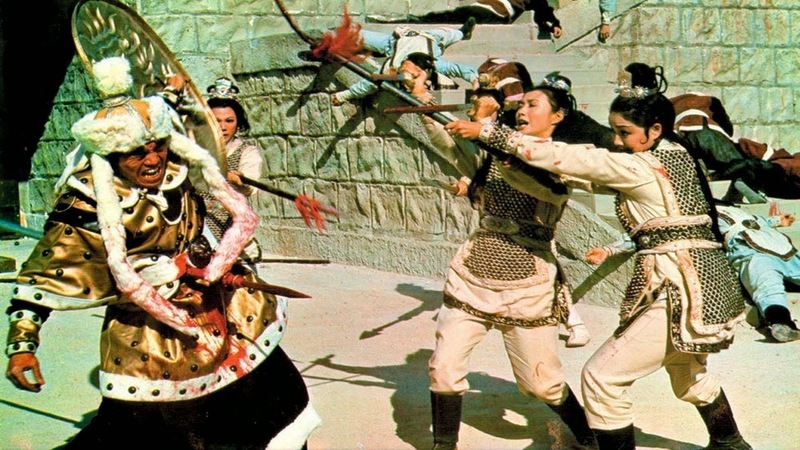 Based on the Generals of the Yang Family (a collection of tales in different mediums about the military exploits of the Yangs during the Song Dynasty), The 14 Amazons is an award-winning wuxia classic that is just as watchable today as it was when released in 1972. It follows the women of the Yang clan as they march West to the border of the Song Empire to seek revenge against the Xia for the death of General Yang Zongbao. Led by the family matriarch, She Taijun, they defy corrupt imperial officials and defend their country against the Xia invasion in a series of intense and graphic high tempo battles. The 14 Amazons was directed by Cheng Kang and produced by Shaw Brothers Studio. It stars Ivy Ling Po (Mu Kuei Ying), Lisa Lu (She Taijun), Lily Ho (Yang Wen Kuang), Yueh Hua (Lu Chao) and Shu Pei-Pei (Yang Pai Feng). Bolo Yeung also makes an appearance in a minor role. 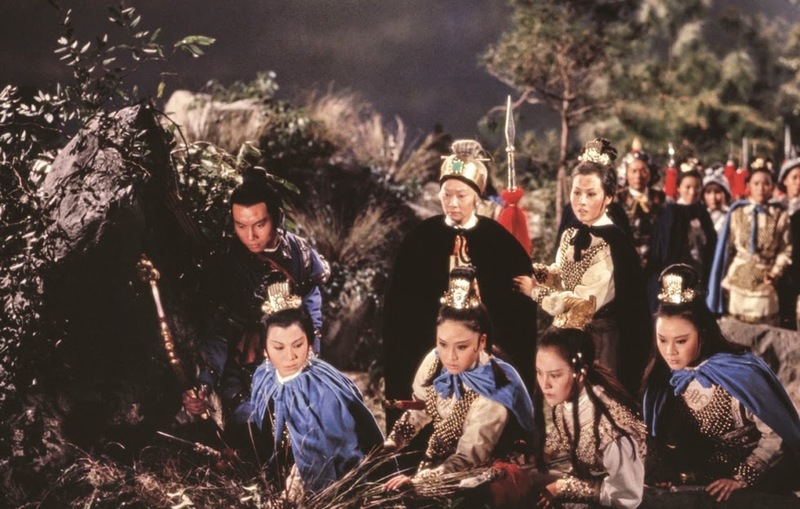 The 14 Amazons is part of the female martial hero tradition in wuxia, which I am informed reached a peak in the 50s but was revived for a time by the films of King Hu like Come Drink With Me. My understanding is early on in the genre the primary audience was female, so female protagonists became a staple but Hu helped create new interest in female heroes. 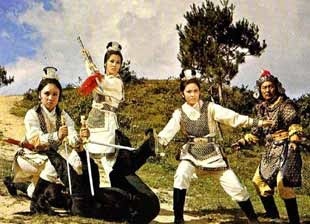 During the 70s the female 'knight errant' would be overshadowed by the male 'knight errant' in Hong Kong wuxia and Kung Fu films but this is part of a period where women still had many prominent roles. This is also a movie packed with talent ranging from Lisa Lu to Yueh Hua. One notable casting choice is Lily Ho playing the role of the male character Yang Wen Kuang. I have heard a few different things about this, with some people saying Wen Kuang was meant to be a daughter masquerading as a son in the film because all the male heirs have been killed, and that the subtitles make this not very obvious. It is possible there is a subtlety in the dialogue I missed in this regard but looking into it, it appears to me that Wen Kuang is a male character and simply being played by a woman. I could be wrong though and certainly welcome the expertise of any readers who happen to know the answer here. It isn't uncommon for female characters to dress as men in the genre but to have a female play a male role is not as common. Either way I think she did a very good job and couldn't help but think she seemed to be doing her best Cheng Pei-Pei impression in her performance. 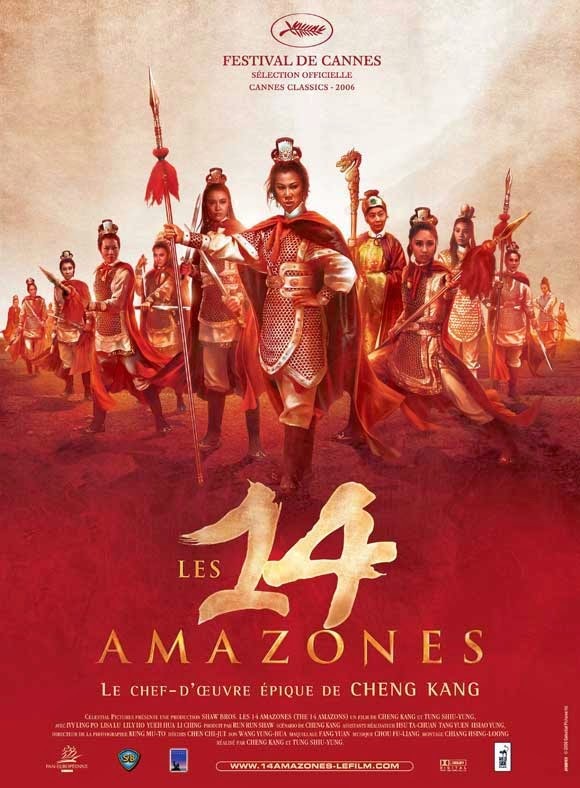 The title 'The 14 Amazons' is just the English translation and a bit misleading because of the connotations of the word 'amazon'. I don't know the precise meaning of the original title but from what I gather it roughly translates into Fourteen Brave Women Female Heroes or Fourteen Female Heroes. Something to that effect. The movie opens with the death of General Yang Zongbao while fighting on the frontier against the Western Xia. He is surrounded and captured, then made to watch as the enemy tortures his men. The opening scene is bloody, establishing much of the tone of the rest of the film. We witness General Yang shot threw with arrows, speared and hit with what looks like a guan gong dao, then see his body kneeling defiantly as blood flows to the earth in a virtual river. It is excessive but also beautifully done and well composed. By this time all of his sons have died fighting for the Song Dynasty except his youngest, leaving only the women of the family to avenge him. After this prelude, we are taken to the Yang villa where the women are gathered to celebrate the birthday of General Yang Zongbao. There are a lot of characters in The 14 Amazons and this scene makes a point of introducing them by name. A few might be glossed over but we are presented with all the various grandmothers, sisters, daughters and mothers. Presiding over the affair is the family Matriarch, She Taijun, played by Lisa Lu. Two of General Yang's men arrive to give news of his death. Both his wife, Mu Kuei Ying (Ivy Ling Po) and only remaining son, Yang Wen Kuang (Lily Ho), vow revenge, but She Taijun says they must first speak with the emperor. The women of the Yang family go to meet the emperor but are greeted by a corrupt and slimy official named Wang Ching, who is responsible for General Yang not having enough reinforcements. It seems the official has convinced the Emperor to placate the Western Xia. This enrages She Taijun who decides that the women of the Yang family will lead their forces to the frontier to protect the Empire and have revenge. As they leave, we get a strong impression of She Taijun's personality when Wang Ching tries to intercept them and stop their march. With another official there to verify she reveals that she has the Dragon-Head Staff, which confers the right to beat corrupt officials and useless emperors when they do wrong. She pounds Wang Ching with it and says she will finish with him when they return. Back at the Xia camp we are witness to the brutality of the enemy they face. There is a mood in the air as the princes deal with their prisoners. Lu Chao, a slave who has been held by the Xia for ten years, attacks one of the soldiers when he tries to abuse a Han woman. He is then forced to fight to the death against an armed attacker (played by Bolo Yeung) and manages to win. Later, when he learns about the plans of the Xia to ambush the approaching Yang forces at Twin Dragon Hill, Lu Chao flees and joins She Taijun's camp where he tells them about the ambush. She Taijun is cautious in her approach of Twin Dragon Hill but also not sure if she can trust Lu Chao. They use a diversion to to gain the upper hand and attack their ambushers leading to a series of heavy skirmishes. They do survive but find themselves hunted by the Xia as they do so and they also lose their supplies to Xia forces. In a clever ploy, the Yangs use shafts of bamboo to retake their supplies from the enemy by draining bags of rice into the shafts down hill. This works but they are followed and attacked before they can reach their camp. Once again they find themselves hunted in the forest as they try to reach the Xia base. They scale over cliffs and through woods before coming to a bridge, which the Xia burn. They manage to get half of their numbers across the bridge before it collapses and are forced to form a human bridge in order to get everyone across. Soldiers and servants guard them from the rear and sacrifice so they can reach the other side. After crossing the bridge they realize their approach to the Xia camp, but know they face greater numbers. Mu Kuei Ying asks General Yang for a sign of how to defeat their enemy and each time she asks, a piece of wood appears in a nearby brook. This gives her the idea of luring the Xia soldiers out of their camp then breaking a dam so they are blocked from return by flooding, allowing them to deal with the King and his men. Cleverly they take the camp by sneaking into the watchtowers and forcing the guards to blow the alarm for an approaching army. The Xia are wary though and ask confirmation from all the towers, but the Yang women have taken each one and the Xia forces head out. There is an intense battle and then a long stand-off when it becomes unclear whether the dam tactic was a success. The Xia king recalls his army and it seems Taijun's men are delayed in forcing the dam open. But at the last minute the damn bursts, engulfing the king's men. This leads to a truly spectacular showdown between the Yangs and the Xia. Mu Keui Ying faces the king in a duel and impales him with a spear. Together the Yang women and Wen Kuang kill the archer responsible for dealing the death blow to General Yang. Upon their return they are greeted as heroes by the court officials, including Wang Ching. The action in The 14 Amazons is thunderous and intense, with combatants unleashing ringing sword combos that chime with each strike. Theses are often rapid displays where enemies are are beaten back steadily by sword blows. It's bloody, brutal and unforgiving, with impalements, beheadings and rivers of blood pouring from the bodies of fallen heroes. But it isn't needlessly gory, the blood spilled is used to paint a scene. This is bloodshed with cinematic purpose. The theme of the film is patriotic, with an emphasis on personal sacrifice even to the point of putting country ahead of family. The blood stains are part of that theme. The stunt work is also exceptional and inventive. 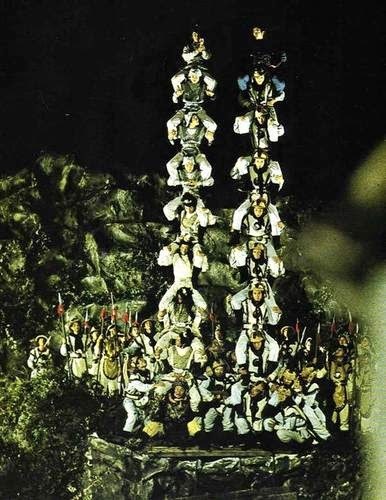 There is one iconic scene where dozens of actors form a human bridge over a ravine, but to achieve it they first have to stack on each other's shoulders. Because half of the people are on one side and half on the other, they each form into pyramids then fall toward one another and grab hands. I doubt the stunt was performed over an actual ravine (it looks like a sound-stage), and I am sure many safety precautions were taken, but I was surprised to read that Ivy Ling Po was in the stunt herself and remarked how frightened she was at the time. While there are a lot of characters, and while this proved a major problem in the 2011 remake Legendary Amazons, The 14 Amazons places most of its focus on She Taijun, Mu Kuei Ying and Yang Wen Kuang (as well as a few other key characters like Lu Chao). So it is relatively easy to follow despite having such a huge cast. This is a solid and exceptionally good martial arts film. Everything from the epic scope to the costumes comes together beautifully. The 14 Amazons is the kind of movie where you can tell a good deal of thought went into the composition of each shot. I strongly recommend it for fans of the wuxia genre. For gamers I think aspects of the movie will inspire, but it may be harder to extract elements for an RPG than some other entries in the genre. There was a more recent movie based on the same story called Legendary Amazons. IIRC, I saw it on Netflix streaming a few months ago. Yes. That one is basically the same story. It was produced by Jackie Chan. Had a very different feel from the original.